Grind grated coconut, chopped onion, fennel seeds and cumin seeds to a coarse paste. In a bowl, add rice flour and salt. Add ground coconut mixture, mix well and make a dough adding enough hot water (about 1 1/2-2 cups). Add chopped green chillies and curry leaves and mix well. Chop cleaned mussels into small pieces and mix well with the dough. 5. 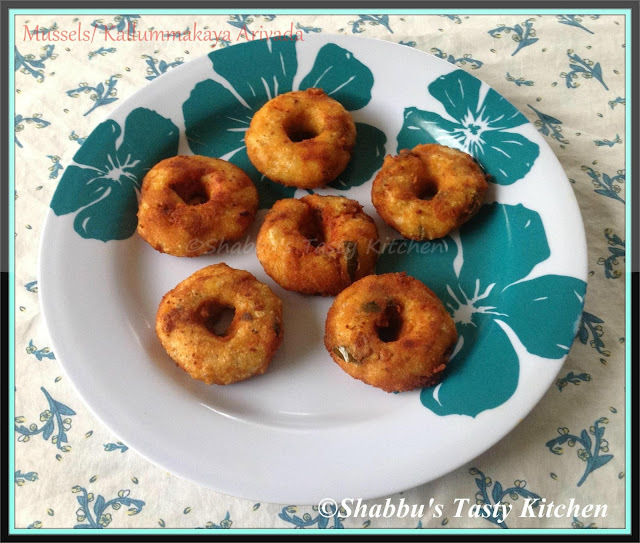 Make small balls out of the dough and flatten it like vada..Place them in a steamer and steam cook till done ( 15-20 minutes). 6. In a bowl, mix chilli powder, turmeric powder, plain flour and salt adding 1/4 cup water and make a paste. super dear, this is really new to me. I make something similar to this with prawns called vaada. lovely, i have bookmarked to make this... thanks a lot for sharing. Very tempting and super crispy vadas..